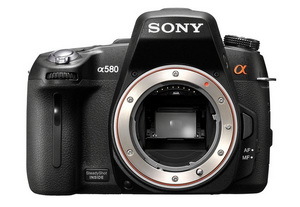 The Sony A580 (body only) is now available at most outlets, after being out of stock for almost two months. I'll be doing an abbreviated review and comparing it to the A700/A900 just for kicks soon. 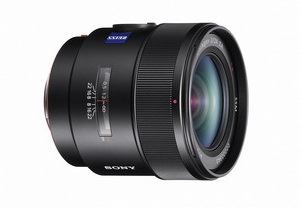 Let's not forget about the long awaited Sony CZ 24mm F/2 review that I hope to have ready by the middle of February. I'll be doing a comparison study with the Sony CZ 24-70mm, Sony CZ 16-35mm and Sony CZ 24mm a little after that, so good things are coming up, check out the list above. If you're a Sony NEX fan you may want to check out the Sony ECMSST1 microphone for better video sound quality, it's currently being offered at $93.00 instead of the usual $123.00. It comes with the important wind screen too. 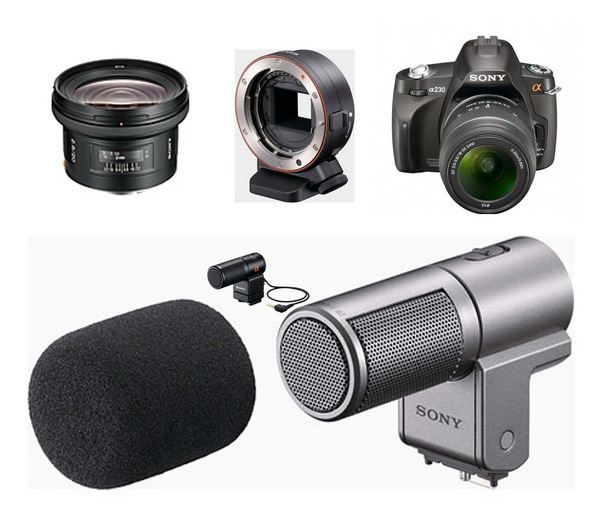 I've noticed you can get a Sony A230 DSLR with 18-55mm kit lens refurbished for $299.95!! This camera and lens would be perfect for a person that wants to step up to a good DSLR, but is short on cash. I wouldn't be afraid of using that camera for a paying job, the camera model is the least of your worries when you show up for a shoot. To make great pictures, the easiest part is to simply be familiar with your camera, whether new or old. I'd like to point out a few camera accessories items as a general service to readers; the $156.62 NEX LAEA1 lens adapter is priced much less from B&H photo than it is at Sonystyle.com, I'll be getting one of these for testing some alpha mount lenses on the NEX system starting later in the year. Also on my list (and recommended gear page) are used Sony 20mm lenses for $479.95, that's about $120 off the retail price. 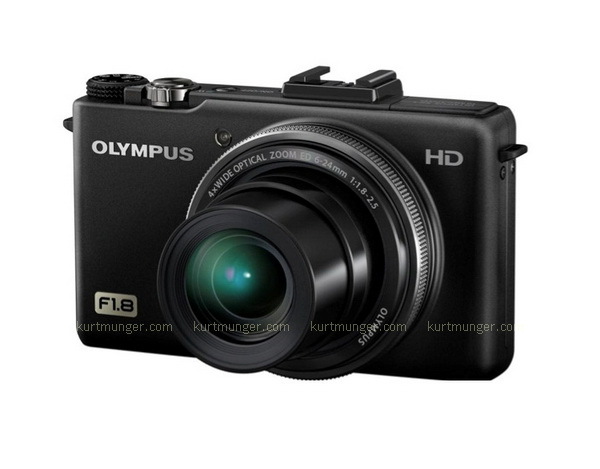 This little camera from Olympus looks like it may be good enough for use as a DSLR back-up, and yes, I'm serious! Dpreview has a good write up about it, but for some reason they didn't include any info on close focus capabilities, which is odd because that's what they used for the studio shots. Maybe it's just an honest omission. Anyways, the most important feature of the Olympus XZ-1 is the F/1.8-2.5 wide aperture lens (with an equiv. range of 28-112mm), but almost as important is the standard hotshoe, which makes it capable of serious on/off camera flash use, interior/studio work, and last, but not least, is the fact you can carry it around in your pocket! It looks like you could make some nice hand held low-light street type shots with this camera, that is, if it lives up to the hype and initial reviews. Well, it's just a thought, the camera isn't available yet, so time will tell if it really is something worthwhile. I don't know if I'll be reviewing the camera or not, but to me it's the most interesting point and shoot camera currently (almost) available. Several readers have asked about options for remote shutters for their Sony cameras. The usual items are; the 25 year old Sony/Minolta corded remote in either .5m or 5m lengths, both fairly expensive for being simple on-off switch type devices, or the remote RMT-DSLR1, which is wireless, but only offers instant or 2 sec release, and has to be fairly close and pointed in the general direction of the camera face to work reliably. There are other options though, and I've listed the products below that I think may work, all are radio controlled and offer a 100m range. The Pearstone and Vivitar look like identical products, but aren't fully adjustable. The Hähnel seems to offer everything you could want, but is the most expensive ($99.50). 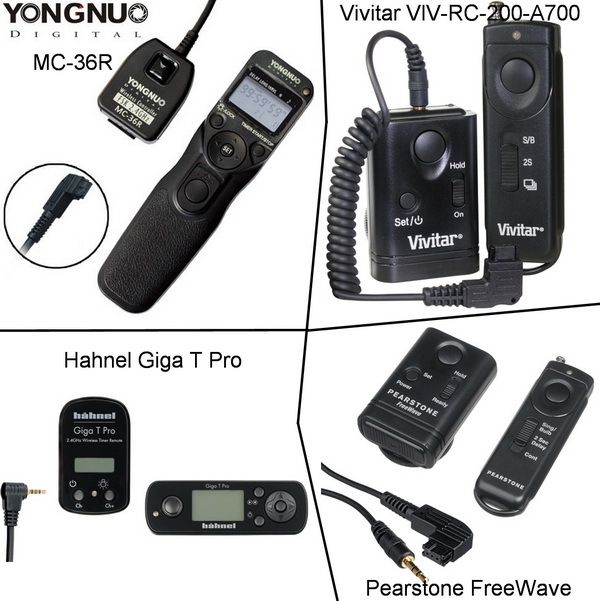 There is a Yongnuo remote that looks good too, but it's not available at the usual photo outlets like B&H photo, you'll have to try Amazon or going directly to Yongnuo. I'm guessing if you want the most reliable operation, you'll have to try the Hähnel or Yongnuo. Hähnel Giga Pro T for Sony. I haven't tried these items, so they won't be going in the Recommended gear page, but I'll try to test one out soon. Readers are always asking me about what camera or lenses etc are best for them, or if it's a good deal. It's really hard to answer questions like that, because I don't know what's important to them, and what their expectations are, but I can make some personal recommendations about what I think is highly useful, and offers a very good value, and in many cases it's the stuff I use on a daily basis. So the difference between this page and the quick lens evaluation page is that the "recommended gear" page lists a few things that I really like, the other page has my overall "take" on camera lenses only. The new page will be located on the nav bar right under the "home" link. I'm only listing what is currently available from Sony and the after-market manufacturers such as Tamron. However, there are a lot of older Minolta lenses and accessories that are good too, but they're no longer in production, and finding good copies may be difficult. This page will be updated as I use and evaluate newer equipment and decide I like it, and when the older stuff is discontinued by Sony. Some people are reporting that Sony will soon discontinue their 50mm F/1.4 lens. A few thoughts come to mind right off the bat; the same thing was said about the Sony A900 about a year ago, and it's still readily available. The Sony 24-105mm F/3.5-4.5 was discontinued about two years ago in a very quiet manner. So what do we learn from those examples; I guess nothing, although as of this posting, the US Sonystyle.com site is listing the lens as "out of stock," but that could be a result of panic orders from all the rumors! B&H Photo has them in stock right now. The chatter seems to be a replacement of Carl Zeiss or "G' branding, but that's probably not necessary (but possible). A good 50/1.4 is not costly to make, and Sony's current version is not really something that needs to be updated immediately in my opinion. The only issue is strong coma on full frame cameras, but for landscapes, it's a great performer. A new version will be welcome however, if and when it happens. More news (as an afterthought), the big lens rental company, lensrentals.com is no longer offering the Tamron 70-200mm F/2.8 because of poor build quality/quality control. My experience with Tamron has always been positive, so that's surprising. The second half of the flash page is done, click the image below. 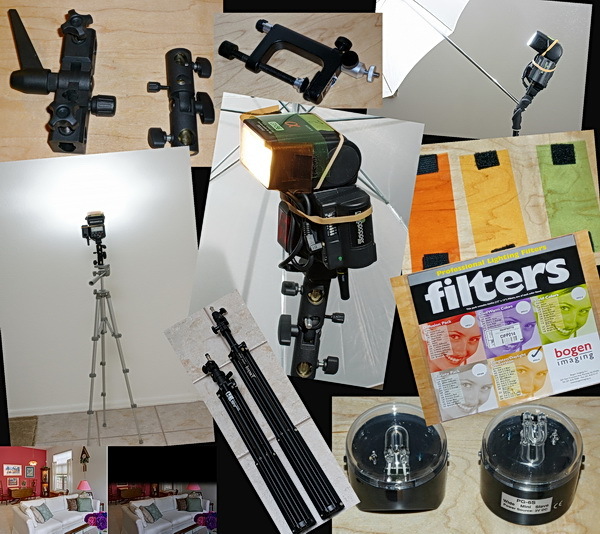 In this section I cover gels, slaves and accessories, how to set things up, and a little on usage. I also added some extra info to the flash section, so if you haven't checked that out, go here. Again, this isn't a "how to" page for properly using the flashes and accessories, I'll cover that in another article. Beware of using the new nickel zinc batteries in your flash units, or you could wind up frying the PC board, like the guy in this site. Thanks to a reader named Anthony for pointing out the proper sequence needed to use the HVL-F42AM with the radiopopper™ system. He also says the Sony HVL-F58AM will work with just an adapter with a sync plug, although I can't confirm that as I don't have one. I do have an HVL-F42AM, and his instructions proved correct, and are as follows; turn camera on, mount flash, turn flash on, then dismount the flash and install the radiopopper transmitter and adapter, then the corded adapter to the flash unit. You'll also need to turn off the flash auto standby mode, otherwise when it powers down, you'll have to repeat the initial set-up all over again. Learn how to turn off auto standby here, and click on the "operating instructions" link (then page 95-96 in English). It's pretty simple and only requires you to press and hold the HSS button for over 3 seconds, then select 35mm on the zoom button, and press the HSS button again. Does anyone know how to fix this "quirk" on the HVL-F42AM so it acts the same as the HVL-F56AM? Also, some folks want to know where I got the corded adapter with the 1/4-20 socket. This adapter cable has a hotshoe specifically designed for the newer Sony ⁄ Minolta proprietary hotshoe, and costs $28.50. It's a little expensive, but it's built well, and so far has functioned perfectly. The company that sells it, FlashZebra, also has a bunch of neat cords and accessories. I'm not affiliated in any way with them, but make sure you tell them I sent you if you order something, and maybe they'll throw me a bone at some point, ya think? The first part of the flash page is up. I've listed the flashes I have, and what is needed to use them with the radiopopper™ system. It's kind of a "getting started" guide using Sony and Minolta flashes, and is not intended to be a "how to" lighting guide, I'll be covering that subject a little later. The next part will be the gel, slave and accessory guide, on the same page, coming next week. I've listed the important specifications for the flash units at the bottom of the page, like recycle time, zoom capability, power levels and what you'll need to use it with the radiopopper™ system. Many people don't realize this but; you don't need to use Sony or Minolta flashes at all for radio controlled flash use, and the camera won't even know the flashes are firing in dumb mode, or simple manual on-off operation. I use manual everything, exposure, flash settings and focusing. When you use the same camera and accessories long enough, you know where the setting are supposed to be, or close to it, so automated operation is not really needed, and not wanted in most cases. As I said, you don't have to use Sony or Minolta flashes. If I had to do it over again, I might go with Nikon flashes, as some people claim their wireless system is much more reliable than Sony or Canon. You can use one or two receivers, and fire any number of flash units that are able to read the flash pulse. In my experience, Sony is not very reliable once you get the flash out of sight or behind the camera. I'm a cheapskate, and won't pay retail for anything if I don't have too. All the flashes below cost me less than $1000 total. 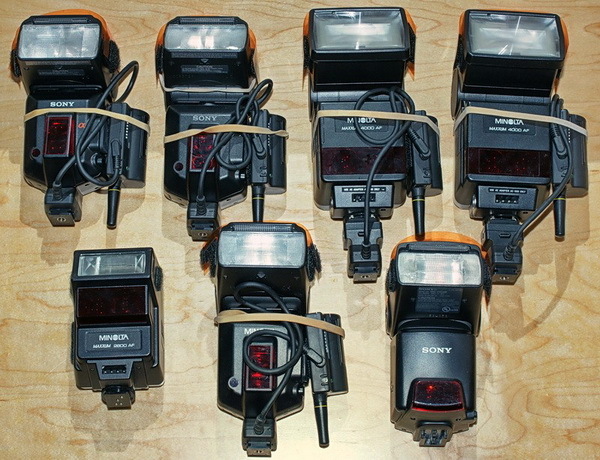 If you want to use Sony or Minolta flashes, that's fine. Buy them on eBay where they're cheap. Most people buy a flash unit, use it a few times, then decide they don't need it and sell it for a loss. There are a lot of great deals out there for flashes, and I think the best deal is the Minolta Maxxum 4000 AF, you can find them for about $20-40 in good condition, and they're perfectly capable of doing a great job at lighting a house interior. You'll have to buy a receiver ($80) and two adapters ($40) because it uses the old style Minolta foot, so you'll have about $150 in the setup, but that's still only half the price of the Sony HVL-F56AM, which is a good unit, but not totally necessary in my opinion, especially for a beginner. One other item, when using the white email box in the contact page, make sure you put in the exact email address, if you don't, I won't be able to send a reply. So the 2011 CES is over, and now we have 11 more boring Sony point and shoot cameras to choose from. Sony made no mention of any new real cameras, I guess we'll have to wait for the 2011 PMA show in September for any new announcements, then, just maybe, we can look forward to a new A700 replacement by this time next year right?...Wrong, that would be a big negatory Sony! In defense of Sony. If Sony is making some handsome profits from the huge selling NEX and SLT systems, why should they wast time on the development of an intermediate DSLR, which probably isn't going to generate big sales or profits. I don't blame Sony for it, they're in the business of making things people want to buy, in very large quantities. I simply wish they would hand off their traditional DSLR system to someone else that desires to further refine and promote it. Is that too much to ask for? On a lighter note; I'm working on the Minolta/Sony off-camera flash compatibility guide using Radio Poppers, and general flash use. I'm going to do it in segments, so maybe I can get some feedback from people and let that guide the final outcome. For some darn reason, I'm occasionally getting blank messages from the white message box on the contact page. I don't know what's wrong, but I'm thinking it might be from using a reassigned function key instead of just clicking the send button. So if you haven't heard from me, it's not because I'm too lazy and snobbish to write back, it's because I didn't see any message. The superb Sony 35/1.8 is sold out from most big photo dealers right now, including B&H Photo. If you didn't get it on sale last year, plan on paying full price from now on, it's still worth it though. One thing I forgot to mention in the last entry is that people that bought the Sony 35/1.8 and Sony 70-400mm are very satisfied, and tell me so. The big zoom is expensive and heavy, but I hear no complaints about image quality, it's really that good. Well, the holiday season is over, that means another year has gone by!! I hope everyone had a fun and prosperous year, and look forward to a bit more prosperity this year, right! For me, last year was busy, both here at the site, and my photo business, but I have much more planned for this year on both fronts, more below. Although I will continue to review new lenses for the Sony α and e (NEX) systems, I also plan on posting some articles that will help the beginner with interior-architectural-Real estate imaging; the importance of using off-camera flash, Radio Poppers compatibility with Sony/Minolta flash units, and post processing essentials. I'll also try and persuade people from relying on the standard HDR technique (which in most cases I don't like), especially when it comes to balancing dark interiors against super bright windows. It doesn't take any more time to set up some strobes and take one shot than it does to take five shots then spend half an hour in PP to make it look like it isn't HDR. The site stats for kurtmunger.com were up significantly this year, with an average of 59,000 visitors, and 139,000 page views per month. I guess not too bad for a personal website, and by that I mean it's just me here, typing away in my spare time, offering my thoughts and opinions about Sony and whatever. Additionally, my bandwidth is about 245GB per month, that seems high to me, especially since I have almost no full size images to view. Is that number high? Anyone know what the average bandwidth is for a site like this? Since I now have a cheap Zenfolio account, I'll be able to link to some full size image samples and comparisons from that site without it blowing my own website BW. Other stuff; I've moved the October and November home page entries to the home page archives. The B&H Photo affiliate sales have been very good for the wonderful Sony DT 35mm F/1.8, thanks to all the people that purchased their lenses or other items through my B&H links, that helps me pay the bills!